Nothing says Christmas like frosty, snow-covered pine cones! 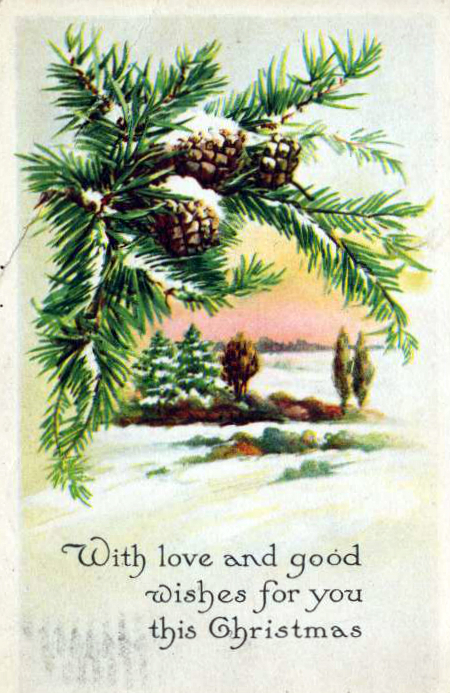 If you love pine cones as much as I do, than you’ll totally dig this vintage Christmas illustration from the very early 20th-century. Originally published by the Gibson Art Company, this holiday greeting card is ideal for your modern-day Christmas cards, holiday collages, pine cone decor, and more Christmas crafts. Need more free Christmas images and ideas for your holiday projects? Head straight to the complete Christmas image library right now and follow on Facebook for exclusive holiday illustrations you can’t find on the site!